The governor with the Kalihi 21st Century Vision Team he initiated to gather ideas for improving the community. affordable housing? More parks and better schools? More services close to home? That’s what Gov. Ige and the state Office of Planning is asking residents to do as part of his Kalihi 21st Century initiative. The committee that includes legislators, community leaders, and non-profit representatives is holding a series of public meetings to imagine a new Kalihi — with rail and without the 100-year-old jail, the O‘ahu Community Correctional Center (OCCC). The jail sits on 16 acres of state-owned land in Kalihi, between two proposed rail stations. Often, he said, the community doesn’t have a chance to weigh in at the beginning of what is usually a complex planning process. “The governor wanted to get more community members involved, thinking about the possibilities at the outset— to hear what they’d like to see and to talk to each other, to make connections within their own Kailhi community,” he said. 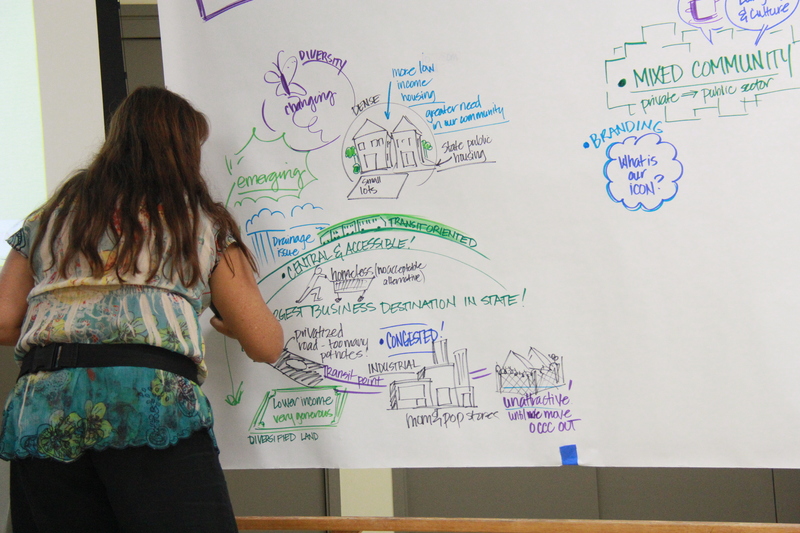 A visual note taker outlines Kalihi 21st Century ideas. And what about the future of rail? “The Kalihi property is also a candidate for transit-oriented development (TOD),” said Asuncion. “Rail is definitely a driver for planning, but the state property is still going to be there, whether rail comes in or not.” In fact, a separate interagency TOD council has been formed to coordinate development along the whole 20-mile rail corridor, with the state of Hawai‘i as the largest landowner of about 2,000 acres within a half-mile radius of the 21 stations. TOD has been described as a tool for achieving “smart growth,” defined as compact, mixed-use, walkable communities reachable by transportation other than a car — whether it’s a bike, bus or rail. 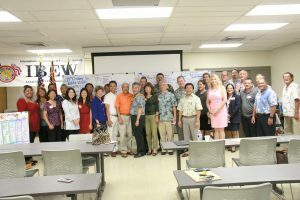 It can be applied to large urban areas such as Kaka‘ako or neighbor island towns such as Līhuʻe, Kaua‘i, where Mayor Bernard Cravalho is promoting smart growth.